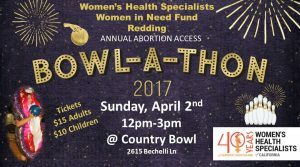 This weekend in Redding, we’re bowling to strike down barriers for abortion by raising money for our Women in Need fund. The Women in Need fund provides folks coming for abortion care with financial help for medical services, transportation, motels, childcare or whatever they need to be able to come to the clinic. Drop-in and party with us! To bowl, it’s $15 for adults and $10 for shoes–that includes shoe rental and 3 hours of bowling! Donate to your favorite bowler or bowling team here!